Bird strikes are an extremely hazardous problem that needs to be addressed. Bird strikes have been an all-too-common occurrence since the dawn of aviation and are an ever increasing threat to aviation safety. Birds can become injected into the plane’s engines causing the plane to lose power resulting in forced landings and expensive repairs. This threat is demonstrated by the “miracle on the Hudson” in which Captain Chesley B. “Sully” Sullenberger guided an Airbus A320 into an emergency unpowered water landing into the Hudson river after the plane struck a flock of Canadian Geese during its initial climb. The Saturn Disc pond float deters birds by restricting their visual sight of the body of water, thus preventing them from congregating. Furthermore, The Saturn Disk pond float acts as a visual deterrent through its light-absorbing matte black color. Some airports have attempted to deter birds by using harmful chemical agents such as 4-aminopyridine, which is a “chemical frightening agent” which affects the bird’s central nervous system. This method is inhumane and cruel as it causes the birds to have jerky, seizure-like movements which can take up to an hour before fatality. Such methods have been denounced by numerous citizens and organizations such as the Humane Society of the United States. These deaths look anything but humane. Dr. John Hadidian senior scientist, Humane Society of the United States. The Saturn Disc Water Cover is an effective and humane bird deterrent. Although wildlife strikes occur less frequently than bird strikes, they present a much greater risk of damage. 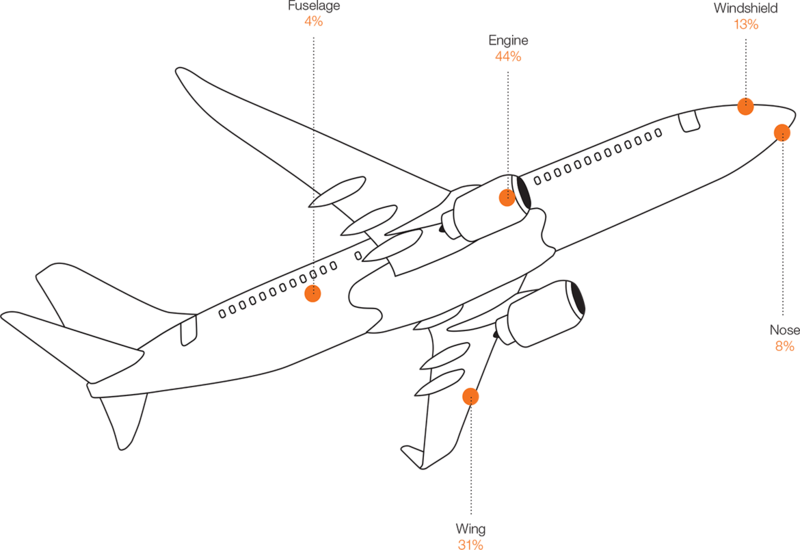 Substantial damage to aircraft is over 5 times as likely when terrestrial mammals are involved as opposed to bird strikes. How does the Saturn Disk Water Cover prevent bird/wildlife strikes? The Saturn Disc Water Cover prevents strikes by obstructing the animal’s view of water, thus preventing them from congregating and loitering. Also the matte black light-absorbing color frightens the animals from the area. The Saturn Disc Water Cover inhibits the congregation of wildlife in a humane, effective, and ecologically responsible manner as opposed to using inhumane and cruel poison. Our solution focuses on eradication by impediment rather than extermination. ∙The Great Lakes Cormorant population increased from only about 200 nesting adults in 1970 to more than 260,000 nesting adults in 2006. ∙In 1890, about 60 European starlings were released in New York City’s Central Park. Starlings are now the second most abundant bird in North America with a late¬ summer population of more than 150 million birds. Starlings are considered “feathered bullets,” having a body density 27 percent higher than herring gulls. ∙About 1,500 Canadian geese strikes with civil aircraft were reported in the United States between 1990 and 2009. About 42 percent of these strike events involved multiple birds. ∙A 12¬pound Canadian goose struck by a 150¬mph airplane at liftoff generates the kinetic energy of a 1,000¬pound weight dropped from a height of 10 feet. ∙The North American population of greater snow geese increased from about 50,000 birds in 1966 to more than 1 million birds in 2009. ∙The nesting population of bald eagles in the contiguous united States increased from fewer than 400 pairs in 1970 (two years before DDT and similar chlorinated hydrocarbon insecticides were banned) to more than 13,000 pairs in 2010. Between 1990 and 2009, 125 Bald Eagle strikes with civil aircraft were reported in the United States. The mean body mass of bald eagles is 9.1 pounds for males and 11.8 pounds for females. ∙More than 219 people traveling by airplane have been killed worldwide as a result of bird strikes since 1988. ∙Between 1990 and 2009, bird and other wildlife strikes cost U.S. civil aviation more than $650 million per year. ∙About 5,000 bird strikes were reported by the U.S. air Force in 2010. ∙More than 9,000 bird and other wildlife strikes were reported for U.S. civil aircraft in 2010. ∙Between 1990 and 2004, U.S. airlines reported 31 incidents in which pilots had to dump fuel to lighten load during a precautionary or emergency landing after striking birds on takeoff or climb an average of 11,600 gallons of jet fuel was released in each of these dumps. ∙More than 950 civil aircraft collisions with deer and 320 collisions with coyotes were reported in the United States between 1990 and 2009. ∙About 90 percent of all bird strikes in the United States are by species federally protected under the migratory bird treaty act. ∙Between 1990 and 2009, 415 different species of birds and 35 species of terrestrial mammals were involved in strikes with civil aircraft in the united States that were reported to the Federal aviation administration.